On April 7, 2017, residents in Dallas, Texas, woke to the sound of emergency sirens blaring all over the city. No one could shut them off, and after repeated efforts to contain the situation, the city had to shut down the entire system. While the media reported a sophisticated computer hack was responsible, the truth was much less high-tech. The sirens in Dallas were controlled by a series of radio signals that weren't encrypted, and anyone could broadcast them with the right equipment. Turns out, someone simply listened in to the radio signal during a test or real emergency that triggered the sirens to go off, then played it back later. 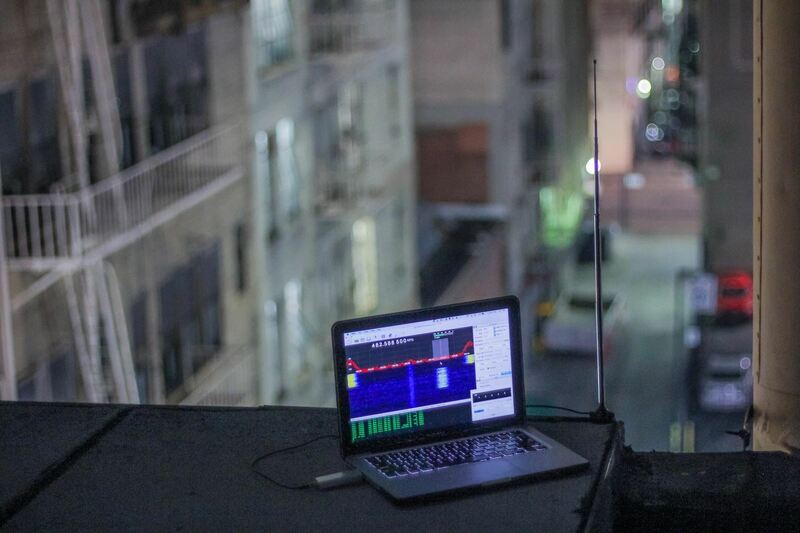 This low-tech hack managed to use the principles of signals intelligence to control a system via radio waves. But how would someone sniff radio signals — and then use them to control or interact with a system? Things like garage door openers, car keys, and apparently emergency sirens are controlled by radio frequencies that can be eavesdropped on, decoded, or even simply rebroadcast to trigger the same effect. 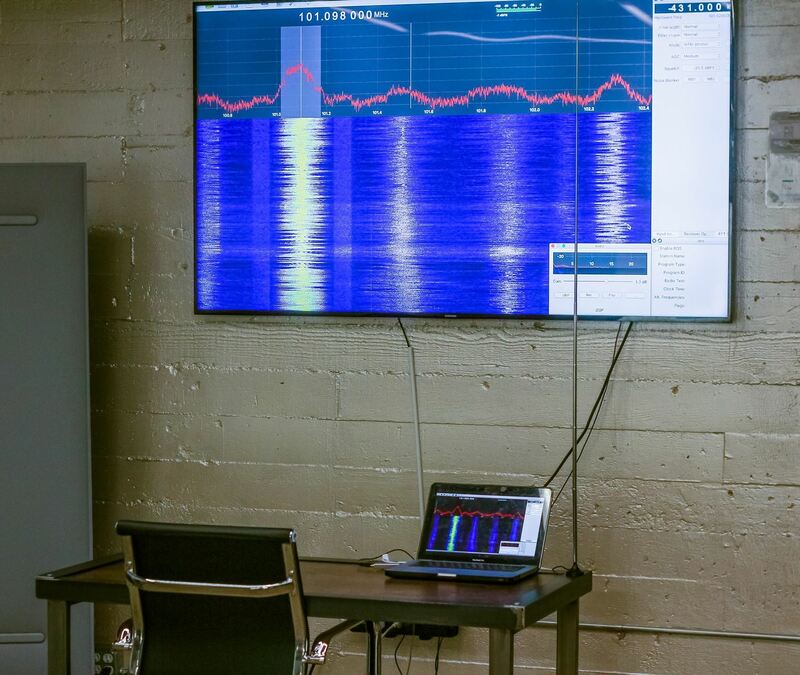 In this series, we will learn to both detect and listen in on these hidden radio frequencies, then rebroadcast or transmit them — on the $35 Raspberry Pi, no less. 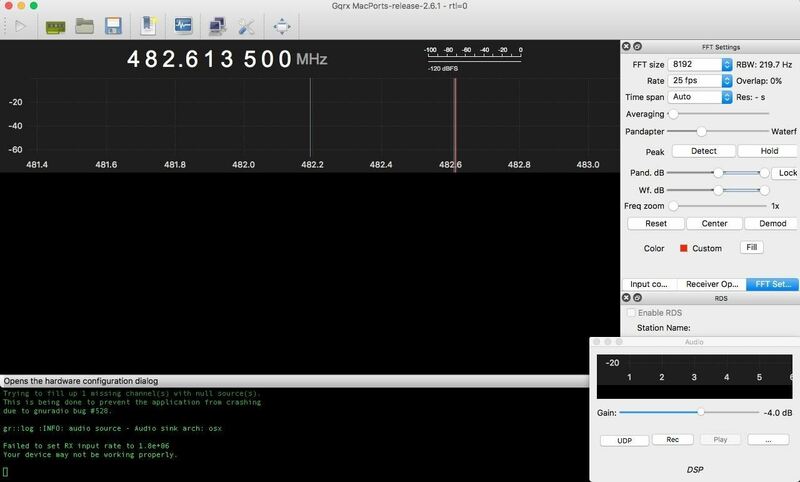 This build will teach you to detect local radio signals outside the "normal" FM band you're used to tuning into in your car or on your commercial FM radio. We will create a portable listening station to explore the VHF (very high frequency) and UHF (ultra high frequency) spectrums and decode digital audio data to make sense of the sounds in the world around you. Example of a hidden radio frequency that I found. This will start our series on signals intelligence (SIGINT), which is the analysis of signals to discern intelligence about a target. 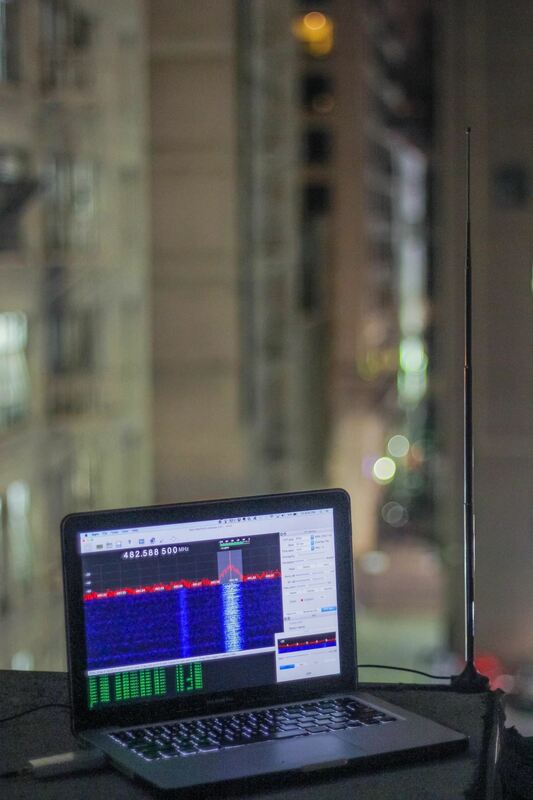 Of course, the first step in analyzing a signal is being able to hear it, so we'll need to dive into talking about both software-defined radio (SDR) and the radio frequency spectrum we'll be pulling the signal from. There's an invisible conversation going around us in the radio frequency all the time. Though we can't see it, we transmit our civilization's wireless data overwhelmingly through the radio frequency spectrum. Visible light sits on that spectrum between 430–770 THz, which is what our biological eyes can sense. But down in the sub-1 GHz range lies much of our radio communication, including FM radio and the communication that takes place between law enforcement and first responders. Wouldn't it be great if you could peer into this spectrum and make sense of signals of your biological body isn't built to perceive? The radio spectrum is huge, so to avoid getting lost, this guide will be quite specific. However, there is a lot to explore and this guide is only the beginning. If you're curious about the signals you're receiving, you can always reference them against this handy chart if you're in the United States. In this guide, 24 MHz to 1.7 GHz is where we'll be operating. 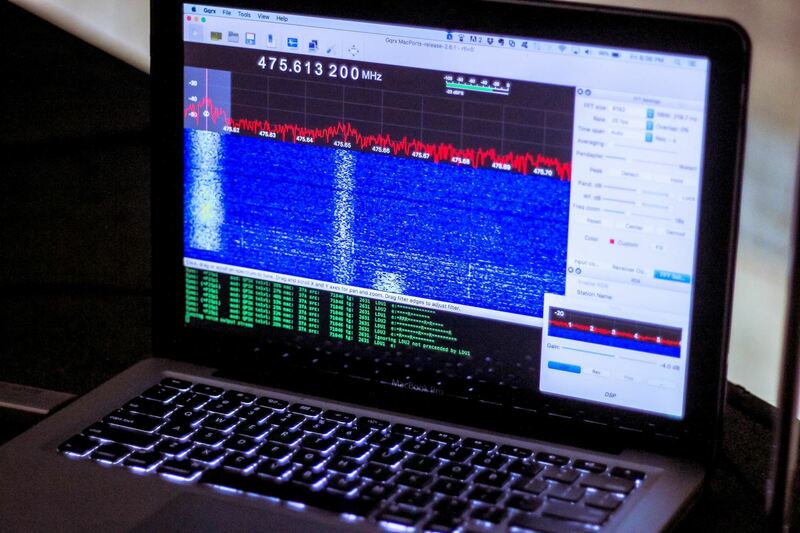 To accomplish this tutorial, you'll need an SDR dongle and antenna to receive and convert the signal. You'll also need software to interpret the radio signal as well as another software to decode digital speech. SDR takes the parts of radio tuning that was normally done by crystals or local oscillators and accomplishes them with software instead. The basic requirements for such a system are a personal computer (or Raspberry Pi), a sound card or signal processor, and an RF receiver to receive the signal. As a result, many of the processes done by dedicated hardware are now done by a computer, making the entire radio system very low cost and flexible. 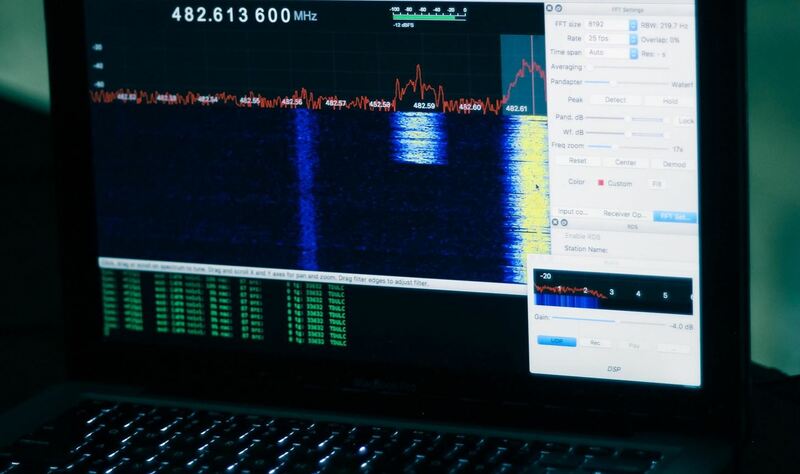 The team at RTL-SDR created a very cheap software-defined radio receiver that uses a DVB-T television tuner dongle based on the RTL2832U chipset, which they wrote a new software driver for to directly access the signal data. Their SDR kit gets you up and running for a mere $25. Your other options, if you're feeling fancy, are the $169 Airspy R2 or the $149 SDRPlay. While those are certainly nice, I prefer low-cost, open-source, and commonly used tools for hacking, so we will focus on the RTL-SDR. I used an RTL-SDR plus two adjustable antennas, but any SDR kit that can tune into around the 400–600 MHz range should do fine. 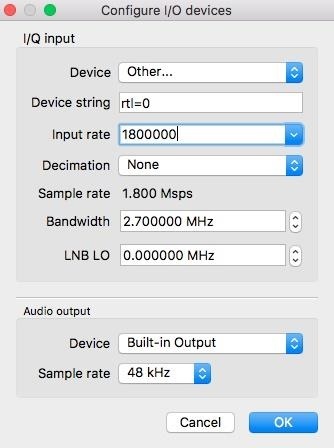 This tutorial will use the RTL-SDR for selectors in our SDR radio program; You may need to modify them to get a different adapter to work. 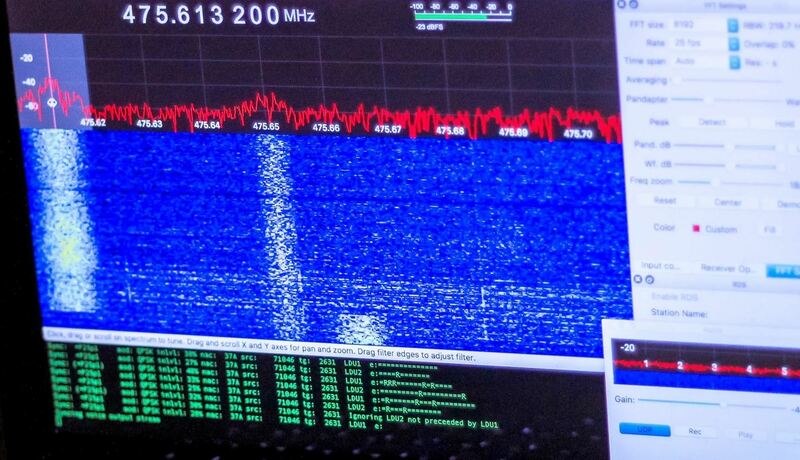 Next, we will need software to interpret the radio signal. The open-source GQRX is my tool of choice, after managing to get it working on macOS Sierra and Kali Linux. This guide will cover macOS. 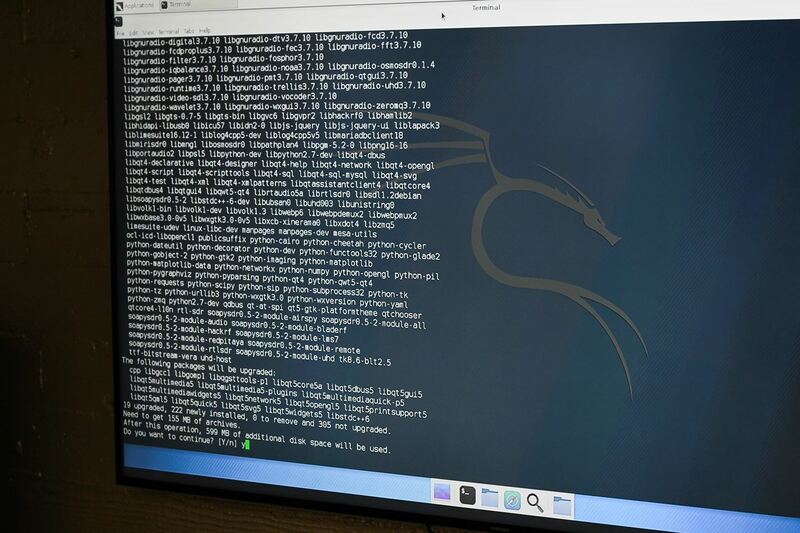 However, I will cover the Kali install on a Raspberry Pi another time, as it requires a lot of dependencies and needs the sound cards to be working properly. The macOS build is more straightforward. My macOS listening post build relies on the ability to decode digital data we intercept live to listen in on conversations. To do so, we will focus on one common type of signal we hope to intercept — digital audio. Digital audio constitutes a signal of interest because it's frequently used by police and security organizations for communication and is often not encrypted since they are encoded. This, of course, is silly since encoding can be easily broken. In my city, police do not encrypt dispatch except for tactical channels, it's just encoded as digital audio, so we'll use DSD to break the code live and listen in to their communications. We do this by streaming the audio via UDP (User Datagram Protocol) to DSD running in a terminal window below GQRX that decodes digital audio. Someone might point out that there are websites where you can stream these kinds of signals decoded by someone with a fancy, expensive radio and streamed digitally. That's great, but the stream is from a third party provided over the internet. Source your own data. For the cost of an SDR tuner and the software to run it, you can target specific agencies in your area for data collection. GQRX, as pictured above in Kali, required a ton of dependencies. Want to compile them for hours? Me neither, so we'll install them using MacPorts. There is also a version available via Homebrew, but I was disappointed to find it didn't work properly. First thing's first, MacPorts. Head to the MacPorts homepage and download the appropriate version, ensuring you've downloaded and installed Xcode and the Xcode Command Line Tools. Once Xcode is all ready, install MacPorts via the guided install, and you should be ready to begin installing GQRX. You may get errors while installing, as I did. For my Mac, this took six tries. Each time I chewed through more dependencies before getting an error and having to start the command over, and each time the list of dependencies got smaller until finally, they were all installed. Eventually, your resolve will defeat the machine and you will finish installing the complete list of dependencies. Successful start screen after installing GQRX on macOS. To install DSD, we will need to install Homebrew since, of course, it's not available in MacPorts. Thanks to Hugh Dev, there is a nicely documented way to install a speech decoder via Homebrew. Run "dsd -a" to see a list of available audio sources. We'll need this later to connect the audio from our receiver too. In this case, it's pretty straightforward. Great! Now we can use these to pipe radio data to DSD. If you try to start capture in GQRX with the wrong settings enabled, it will likely crash. Click on the hardware configuration tab (the green chip icon next to the "play" symbol on the top left of the screen) and enter the configuration to match the following configuration. Once your configuration matches mine, click okay and then plug in your RLT-SDR with antenna deployed. Due to something I did, I'll remind you to turn down your audio, take out any headphones, and turn down the gain. Next, click the play button to start the capture. In this case, I'm detecting a radio signal I'm sending from a nearby Raspberry Pi's GPIO pin. If everything went well, we have the entire spectrum the RTL-SDR can tune into at our disposal. For practice, tune to a channel between 88 and 102 MHz, the standard range for FM radio. Set the "mode" to FM mono (or stereo depending on which sounds better), and click on a strong signal you can see in that range. You should hear audio play. You're tuning into public broadcasts. Explore up and down the frequency to start finding other unencoded broadcasts, using the guide above to understand the signals you find. Look up what frequencies emergency services in your area use and navigate to that set of frequencies. If you live in a city like I do, this should be lit up with transmissions that look like "waterfalls" of data rather than waveforms of FM transmissions. In these frequencies, you may find unencoded dispatch frequencies and private security company two-way radio communication as well, but you must switch modes to hear it. Switch "mode" to narrow FM and try tuning into an unencoded audio stream if one is available. If one is not, target a waterfall that looks like the one in the picture below. Select the "UDP" option in the audio window as shown below in blue to output our audio to DSD. Look for streams that turn on and off. Always-on streams are usually trunk relay units or other logistics-related data transmissions that aren't human voices we can decode. Once you find a promising one, let's try decoding it. With the station locked on and UDP selected, run the following in terminal to check if the output is working. If so, run the following to begin decoding digital speech, with pa:1 the number of the output device we found before. As packets are received from the air, they will show up in DSD. The packets in the photo above are indicative of a digital voice transmission being intercepted and decoded live. Some signals won't yield voice because they are encrypted (rather than encoded) or require some tweaking to lock on to. Try narrowing or expanding the filter, adjusting the gain or squelch, or going up or down the spectrum to get a voice stream to begin flowing through DSD. Be creative in your antenna placement and note differences in reception in response to things you do or places you put it. This build gives you the ability to scan normally invisible spectrums and begin to listen in on those who may think they are communicating in private. While decoding radio broadcasts is legal in the US, things get interesting when we go up to cellular phone and Wi-Fi transmissions. Make sure to check out my follow-up guide, where I go over broadcasting signals from a Raspberry Pi in the radio spectrum by simply adding a piece of wire. can someone help me with steps of how to hack webcam? Sure, give me a little. How can it be used for yaesu vx7r ? And how close must it be? Hey Sadmin, did you end up making a guide for this using Kali on Raspberry Pi? Just wondering since you mentioned it in "The SDR Software"-paragraph..